Something eerie’s happening at *SCAPE. The ghoulies and ghosties are out in force for the opening of Museum of Horrors, a one-of-a-kind show by Movie Mania that pays homage to Hollywood’s meanest monsters, goriest scenes, and creepiest themes. It’s a scream-a-minute experience, rife with disturbing dioramas, interactive sets, and monsters galore. 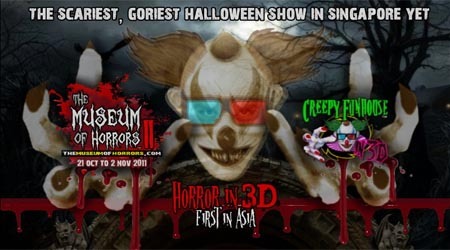 What’s more, visitors can expect a whole new dimension of horror, in spook-tacular 3D, as they meander through Asia’s first ever 3D Halloween mini-maze. As part of our Halloween promo, we’ve got some Museum of Horrors tickets up for grabs. All you need to do is LIKE our Facebook fanpage, and answer a simple question to qualify. We’ve got 2 pairs of tickets to give away, and this contest ends this weekend (23 Oct), so get to it! If there’s one thing I actually enjoy about British cinema, it’s that you can always expect a good story. And Triangle, which opened quietly over the Lunar New Year weekend, stayed true to this promise. The premise, at least initially, is not particularly horrifying. Jess (Melissa George), a single mother with an autistic son, has been persuaded by a friend, Greg, to take a much deserved break. And that’s why she decides, after packing her son off to school, to join Greg and his friends for a day out at sea in Greg’s yacht, the Triangle (from which the film takes its name). Things get complicated when they’re hit by a storm, losing one of their party (Heather, who has all of 15 minutes of screen time) in the process. Hope comes in the form of a passenger liner, the Aeolus, and our stranded vacationers hail it after seeing a figure on deck. Clambering aboard, they begin making their way to the skipper’s office, but are sidetracked when they discover the decks and corridors abandoned. As they navigate the ship’s seemingly endless maze of rooms and passageways, Jess, who has been on edge the entire time, claims that she remembers the ship, that she’s been on it before, and things come to a head when she spies an elusive figure, prompting the group to split up and investigate. That’s only the setup, mind you, and where the twist happens, completely changing the game plan. It gets a whole lot better and gorier after that, I promise you. Fans of Donnie Darko, Higurashi no Naku Koro Ni (and by association, Umineko no Naku Koro Ni) will certainly appreciate how Triangle plays out. Director Christopher Smith, who was also responsible for black comedy Severance and Black Death (which I’m really hoping to watch), delivers not only a healthy does of plot and the heebie-jeebies in Triangle, but the film’s also unique in the sense that it’s one of the few movies where time loops, which take a fair bit of panache to execute, are used as a plot device. There’s subtle, yet powerful foreshadowing. The story of Sisyphus, doomed to repeatedly roll a rock up a hill for eternity, is recounted by one of the characters early on, and the seagulls, ever present, evinces Coleridge’s Rime of the Ancient Mariner. 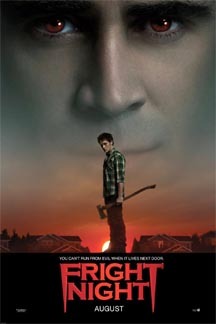 Even with such a tricky premise, the film delivers. Its narrative isn’t hard to follow, and through its three iterations, fills in gaps that aren’t immediately apparent early on. The acting, especially George’s performance, proved proficient and believable. The mania and nervous energy radiating from her was certainly impressive, and Smith’s control of both pacing and atmosphere, his camera work, and the way key scenes were crafted lent the movie a gripping edge. It’s a shame such a great film’s showing on only three screens, and only for another week or so. If you like this kinda thing, you better catch it quick.